One of the biggest cities in the state of Utah, Provo is located in the central part of the state and is the county seat of Utah County. Provo is technically the third largest city in Utah and covers an area of 44.2 square miles. 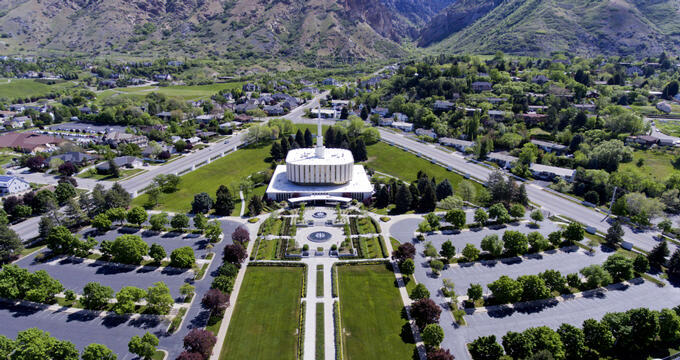 It has an estimated population of 117,000 people, with over 526,000 living in the surrounding metropolitan area, which also includes the city of Orem. Provo is an important educational and cultural city for Utah, home to Brigham Young University and the biggest Mormon Missionary Training Center. The area that would eventually become known as Provo was initially called 'Timpanogots' and used by the Native American Timpanogos tribe, who relied on the nearby Provo River for sustenance. A Spanish missionary named Father Silvestre Velez de Escalante was the first European to come upon the area and trade with the Timpanogos people, but it wasn't until 1849 and the arrival of Mormon settlers that the foundations of Provo were built in the form of Fort Utah. The Provo War was fought between the natives and the Mormons, forcing the Timpanogos out of the area and allowing the expansion of the city. In the years that followed, many follows of the Mormon faith chose to settle in Provo, which was named after a French-Canadian trader and trapper named Etienne Provost. Nowadays, the city is seen as a key hub for Mormons due to the presence of the Missionary Training Center and Provo Utah Temple, as well as a popular recreation area, with nearby locations like Bridal Veil Falls, Mount Timpanogos, the Provo River, and Utah Lake offering many opportunities for outdoor activities like climbing, kayaking, and fishing. Elevation is a key geographical term that tells us how high or low a location is in comparison to the mean sea level of Earth. Elevation is most commonly measured in feet or meters and can be applied to towns, cities, mountains, and any other point on the planet. The elevation of Provo is very high at 4,551 feet (1,387 m). The average elevation all around the United States is 2,500 feet (760 m), so the elevation of Provo is over 2,000 feet (610 m) higher than the national average. Most major cities around the United States are situated at elevations much lower than Provo as many of them were founded in coastal locations. Provo is situated at a very high elevation that matches much of the rest of the state of Utah, which is the third highest state in the nation behind Colorado and Wyoming. Utah’s average elevation is 6,100 feet (1,860 m) as it features many mountainous regions, so the elevation of Provo is significantly lower than the state average. The highest point in all of Utah is Kings Peak, which has an elevation of 13,534 feet (4,125 m), while the lowest point is the Beaver Dam Wash, not far from the Arizona border, which has an elevation of 2,180 feet (664 m). The highest city in all of Utah is Brian Head, which is located at an extremely high elevation of 9,800 feet (2,987 m). Many of the state’s major cities are lower than this, but still very high compared to most urban locations around the United States. Salt Lake City, for example, is situated at an elevation of 4,226 feet (1,288 m) and has a high point of 9,410 feet (2,868 m). Other major cities around Utah include West Valley City, which has an elevation of 4,304 feet (1,312 m), and West Jordan, which has an elevation of 4,373 feet (1,333 m). The city of Provo has a humid continental climate and its high elevation contributes to its weather conditions. Provo has four seasons with unique characteristics. Summers tend to hot and dry in Provo, with average daily highs of 93°F (34°C) in July, while winters can get quite cold and wet, with lows of 22°F (-5°C) in January. Provo sees over 57 inches of snow each year, with most if it falling from November through to March. The city is a popular hub for outdoor activities and exploration, with various beautiful natural locations to enjoy like the Provo River, Utah Lake, Provo Canyon, and Bridal Veil Falls. Kayaking, fishing, climbing, and hiking can be enjoyed at these locations around the city. Provo is also home to various green spaces, museums, and convention centers, with live events and festivals running at various times throughout the year.